Who Made Your (My) Clothes? This week it is the two-year anniversary of the Rana Plaza disaster. On 24th April 2013 the Rana Plaza garment factory in Dhaka, Bangladesh collapsed killing 1133 people and injuring 2500 more. The people killed and injured were making clothes to be sold in Western countries. Many of the companies resisted paying compensation, some even denied their garments were being made in the factory at all. Benetton (one of the companies that originally claimed not to have used firms located at the Rana Plaza complex) only agreed to donate money to the victims’ compensation fund last week, almost two years since the accident happened. With all the major Western fashion retailers involved having contributed, the fund remains $8 million short of its target. 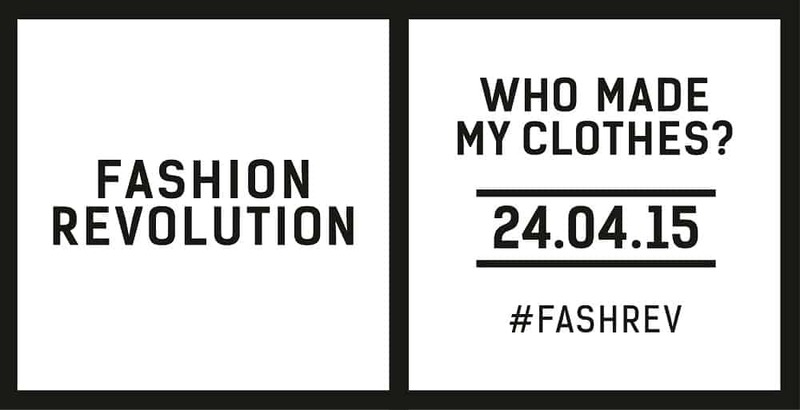 To ensure that these deaths and the tragedy that occurred would stand for something, Fashion Revolution Day was born. 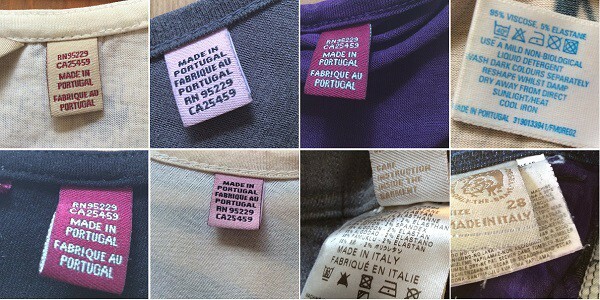 The idea is to make people question where their clothes come from – who made our clothes? Often we buy garments with no idea who was involved, what their working conditions are like, whether they are paid a living wage or where they even live. Fashion Revolution Day exists to try to reconnect us with this chain and the values and relationships that are embedded in it. A good proportion of my wardrobe is second-hand, and since 2013 I’ve pledged not to add anything more to my wardrobe in an attempt to minimize and streamline. My goal is less items, more staples, better quality, responsibly manufactured, and made of natural or sustainable fabrics. Sure, there’s been a few hiccups along the way, but I’m slowly wearing things out. But do I know where my clothes were made? Well, I didn’t…but in the spirit of Fashion Revolution day, I took every single item out of my wardrobe and read the label. Every single item. In fact, I took a photo for prosperity. There were a few things with labels so faded that they could no longer be read, and socks and tights don’t seem to come with labels, but everything else has been inspected. Hong Kong: 2 items. Phillipines: 2 items. India: 6 items. Bangladesh: 2 items. Portugal: 6 items. Italy: 2 items. Malta: 1 item. Morocco: 3 items. South Africa: 1 item. Sri Lanka: 1 item. Israel: 1 item. Australia: 1 item. Romania: 3 items. USA: 1 item. I was shocked. The items in my wardrobe come from 16 different countries, plus 2 have no labels at all. Who knew my wardrobe was so multicultural? I certainly didn’t. Of course, knowing what country at item was made in doesn’t tell me the conditions of the factory, or the minimum wage of workers. I like to think that by choosing not buying the cheapest brands (even buying most of my clothes second-hand, I avoid the cheapest brands) means I’m avoiding the sweatshops, but actually…how do I know? Now I’d like to hear from you! Have you heard of Fashion Revolution Day? Are you taking part? Do you feel you have a good sense of where and how your clothes are made? Maybe you make them yourself? Or are you like me with no real sense of where they came from? Do you have any tips for finding ethical and sustainable brands? Please share your thoughts and ideas in the comments below! ← Can this Empty Tin of Tuna Save the World? 25 Responses to Who Made Your (My) Clothes? It is great that something positive has come out of the Rana Plaza disaster. We can no longer close our eyes for the conditions of those making our clothes. I follow a Swedish blogger who buys food and clothes directly from its producers. This has inspired me to look beyond shops and search for people who actually make clothes. A while ago, I purchased a tailored made skirt and some basic tshirts (made with organic fabric), all put together locally. In Sweden there is a brand called Woolpower that makes clothes from wool. Although they import the wool, it is processed and put together in Sweden, where they pay fair wages. The label of each item even includes the name of the person who sew it! I agree completely Annemieke – people really are starting to ask questions and demand accountability from these companies. That sounds very interesting – what is the name of the blogger (and do they blog in Swedish)? The first thing I need to do is to switch my staples to organic / fair trade / ethically made products, but I intend to wear the old things out first. https://husfadern.wordpress.com/ is the blog. It’s in Swedish. Thanks! Google Translate here I come! I didn’t know this day existed until reading your post , I do however remember seeing the disaster when it happened. We as a family do buy mostly second hand clothes where we can with exception to school jumpers which are made now with the logo on, my mum hand knits my daughter school cardigans and I make nearly all my daughters dresses , skirts , trousers , etc and adapt clothes to make them last longer and my sons pass on to the youngest son and also their t shirts get made into night dresses and shorts for my daughter so we don’t often buy more clothes , but it got me thinking about the material I do buy for my daughters and my clothes I have not a clue where it was made . I also buy from jumble sales and sometimes when I look at the items when home I see some are the cheaper super market clothes, I will certainly be looking into this more now. thanks for posting this as it has got me thinking there is more I can do even though I thought we were quite savvy. Hi Julie, thanks so much for your comment! Like you I buy most of my clothes second-hand (but unlike you I don’t have the sewing skills to make the others!) and until I heard about Fashion Revolution Day last year I thought that was good enough. But then I started questioning whether I could make more ethical choices, particularly for stuff like underwear that I wouldn’t buy second-hand. It’s hard to find ethical brands second-hand, but I feel that buying new supports a fledgling industry that needs my support. That said, I still need to do a lot more research into what to buy, and where. The other thing I’m interested in, which I didn’t really discuss above, is choosing materials that are biodegradable, like wool, silk, cotton and hemp, and avoiding polyester and other plastics. I think I still have a long way to go! Good luck with your investigating! Lindsay, You have highlighted a subject that I feel deeply about. I remember that disaster and it sickens me to think about it. I’m sure that there are all sorts of horrendous labor practices out there, and we as a society need to start doing something about it. The clothing industry is a good place to start. This is such an important topic and I’m so glad you decided to cover it. I am looking forward to reading about any more progress you make on this! I am such a newbie on this myself, and would also love to learn any tips that anyone else has. The start is been made years ago, but it does not go on properly. I’m in this subject for many years and always looking for possibilities to buy ethical ok clothes, even for my kids. The first look is always on the label. Many things can be bought ethically; there are several Companies who sell t-shirts, blue jeans (kuichy, armed angel, people tree …) but the most difficult thing are shoes and outdoor-clothes, underwear. There is a change in the minds of outdoor-clothes companies but the change is very slow. And they always say, that the customers want to buy cheap, so they have to produce cheap in the eastern countries, not more only China; Bangladesh is even cheaper, some parts of India as well. Without the internet you hardly can find fair-paied chlothes. The fairtrade foundation names M&S als a reseller of fairtrade cotton, but if you take a look on their homepage, you only find one or two t-shirts with the fairtrade label. It would be revolutionary if M&S — for example — would switch to fairtrade the whole range of their clothes, but that never would happen. Long speech short: buying second hand is the best way to give an preloved item a new life. Myself, I’m sewing/knitting/crocheing nearly everything besides trousers and underwear for my wardrobe and I always encourage my kids to do so. My husband is very severe with himself in buying new cloths and he would rather leave the item in the shop than buy sth. from a sweatshop. In Germany there are several onlineshops who sell ethical ok items. And from time to time you can find a shop in a big town like Berlin or Köln, Frankfurt, München. Perhaps the fashion-revolution-day tomorrow will make some people more sensible to what they wear on their skin (it is not only the unfair-payed-problem, the clothes are mostly dyed with very poisoning colours, poisoning for those who have to make them and for them, who want to wear them) and how they are made and how many miles they had to travel to come to their goal in wardrobe. I definitely agree with second-hand being ethical – I guess it depends on what the item is. I would like to give my money to support upcoming ethical designers, but also many clothes aren’t made to be worn often, they are designed to wear out quickly so we buy more! I guess it’s a balance! Thanks for your great comment Susanne! so, why not make your own? this is such a useful skill. most shops that sell sewing machines have classes. probably high schools offer sewing in their night schools and community colleges offer some classes under fashion design departments. there are private seamstresses who may be willing to take on a student. there a thousands of tutorials on the internet. at least learn to mend and repair to take care of what you have so you don’t have to buy more mystery goods. learn to knit and you can use local wool to fashion sox and sweaters/jumpers. the more you learn, the more you can avoid those ethical problems. I can’t weave sufficiently to make cloth–just throw rugs, but I can get cotton cloth grown and woven in the usa for at least part of my needs. feels creative, inexpensive and ethically sound to do it myself. if we were neighbors, I would be happy to teach you. That is what I want to do! In fact, that is what I have been saying for almost two years – that I will get a sewing machine! Well, I have pledged to get myself one in the next two months. There – a deadline! I have plenty of friends who will be able to help, I just need to take the first step. Knitting – let’s take things one step at a time! But yes, I want to add this to my list of skills. It must have taken a while to go through all your items. I always cut away those little labels because they are bothering me terribly with itching. I like to think of myself of someone who buys most stuff from US based small designers. But honestly, I get many basic things online from gap right now. Because they have lots of baby and maternity clothing. Was slightly wondering where this stuff is made. But didn’t really invest time to investigate this. I’m glad I read your post, because it makes me wondering about my buying habits. Guess I’ll start researching my stuff better, trying to find better alternatives. Hi Inge, yes it did! But I felt it needed to be done. I’d also be keen to go through again and see what everything is made of, and how much is plastic (like polyester) versus natural fibres like cotton, wool and silk. But I’ll save that for another day! It’s hard to work on all things that we care about, espeically at the same time! As I finish working on one thing, another pops up, and right now it’s making my wardrobe more ethical. If I can inspire you to start looking at your buying habits too then that’s great! This is the first time I’ve heard of Fashion Revolution, that’s why I love visiting you I always learn something new. :-) I don’t know where my clothes come from but I like to think I am not contributing to the conditions that existed in Bangladesh by buying second hand. It’s not a perfect solution but it’s the best I can come up with. I only buy when I absolutely need something too so my wardrobe is very small. My son was picking on me about my shoes. He asked me how long I had them and at first I thought it was about five years but when we talked further he pointed out that in fact I’ve had the same pair of shoes for eight years. They are looking a bit old, but since I can no longer walk I figure they will last several more since all I need them for is to cover my feet when it’s not appropriate to be barefooted. Of course then I pointed out my summer sandals I’ve had since he was eight. He’s now 27. He just shook his head and walked away. Sure my shoes are old but they still work and it’s easier for me to ignore them than to find ethically made shoes. Likewise! Isn’t that what blogging is all about?! I think minimizing is the main step. I gave up on fast fashion years ago – even as a kid in school I could never keep up with what was fashionable, so I gave up! That’s not to say I haven’t bought items that really didn’t suit me (and so I never wore). But I really want to buy quality items that last, made from biodegradable fabrics in ethical conditions. That’s my goal. And for my wardrobe to be a quarter of its current size! I have some black trousers that I bought whilst at uni – and I graduated in 2003! I’ve redyed them three times – I’m sure the dye isn’t very environmentally friendly (I didn’t think aboutit at the time) but it has meant the trousers are still going. Actually, I think I have several items I bought at uni still hanging around! Hi Lois, did you see the comment Su-lee left for you below? Firstly, thank you for your always stimulating posts. Secondly, from my experience it is not easy to find a brand, or a product, that covers the whole process/supply chain fairly (be it for the people involved, or for the environment). With regards to finding ethical and sustainable brands, the one brand I personally have liked (and worn) for many years is Patagonia. You can find a wealth of information that spans from how cotton is grown to their supply chain on their site (http://www.patagonia.com/us/environmentalism). The other company I have discovered a few weeks ago is Anjel Ms, they have a shop in Freo and also a stall at the markets. They sell beautiful fair trade garments made in Nepal and Bali. However when I asked the owner about the fabrics themselves, whether they were fair trade, she explained that that is too complicated to control. This brings us to fabrics. I have purchased some organic cotton ones in Perth recently, and I suggest you check out Materialise (http://www.materialiseyourlife.com) and Calico & Ivy (http://www.calicoandivy.com). Both these shops have a vast array of excellent quality cottons, linens (also mixed with silk) and more. Most of the fabrics are Liberty of London (which I can not find out where is made) or Japanese ones (these are made in Japan). Still, I would not know where the cotton used to make these fabrics was grown, how, nor how much people were paid. A final mention with regards to yarns (in case you wanted to knit or crochet something warm), I have started using a Japanese brand, Noro, which offers a vast choice of yarns made of natural fibres. You can buy it from Calico & Ivy or Yarns on Collie (Freo). Hi Stef, thanks for your comment and all this useful information, and apologies for not responding sooner – the links must have diverted your comment to the junk folder, from where I’ve just dug it back out! I agree that it is hard to find a company that ticks all the boxes. I think the owner of Anjel Ms was involved with the Fairly Fashionable event in Freo last year. There is so much more research to be done (by me) on this I think! I’m also not sure who manufacturers my clothes. I’ve mostly bought tailor made suits, so I assume it’s an individual. Where do you read (on the tag) what fabric your clothes are made of? Hi Alex, thanks for your comment. I see your profile links directly to a suit manufacturer site and so I’d suggest the most obvious thing to do would be ask the people you are buying the fabric from. It seems bizarre that you wouldn’t know this information…unless you do, and your comment was just a thinly disguised plug for your site? Buying the best quality designed, with wonderful fabric ethically sourced means to me that I will have and love that garment for a really long time, that’s real value-I have a silk dress & ‘petti’ that cost me $300 in 2000, (locally made to Byron Bay, from an ethical fabric source the label had said) And I am STILL wearing it now, in L.A. spring…My Hubbie is amazed! I am sorry to read of your Son disparaging comments on your shoe-wear Lois, I definitely have gorgeous shoes and boots that I will wear till I can physically no longer wear them!! ‘Rag and Bone’ are based in NY-they handmake much of their boot range there. Many of those more designer brands do, and they usualy say so on the sole of the shoe. I am sure it is possible to look them up as well, to discern this info. And Lois, ETSY is a great place to find handmade shoes and boots & foot wear [with ethically sourced materials ]. Hi Su-lee, thank you so much for your great comment – I love how you know so much about this! I totally agree with you about buying quality products that last : ) I also agree with you about people using the price argument – I find it very frustrating that people are so mismatched with their proclaimed values!